Heel pain is another of the most common reasons why children come to see a podiatrist. Heel pain is common in all age groups, but in children, and even adolescents, the cause of the pain is vastly different than that seen in adults. 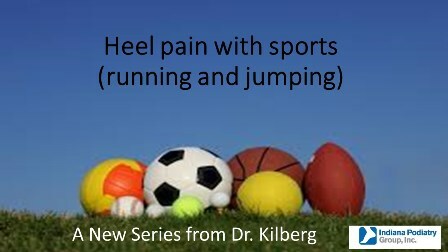 While in adult’s heel pain is typically caused by inflammation of a ligament in the arch (plantar fasciitis) or in the Achilles tendon depending on the location of the pain, heel pain in kids is usually caused by inflammation in a growth plate in the heel bone. This is also known as Sever’s disease, and it is common during late childhood and early adolescence. It is often seen in athletic children. Those that participate in year-round sports seem to be the most likely to get it. The Achilles tendon is often part of the problem, as it can pull directly on the growth plate in the heel bone. Tightness of the Achilles tendon can worsen this pull, and lead to bone inflammation. Symptoms typically include pain with sports (running and jumping), while daily activity such as walking are usually not painful in most cases. The pain can be felt anywhere in the heel, but is typically worse on the bottom back of the heel pad. Inflammation and warmth at this site is rare, and may indicate an uncommon but more problematic growth plate injury or even rare tumor. Treatment usually involves only support, as this condition may come and go until the growth plate fuses, after which the condition resolves. Rest from athletics is important. Support measures often require stretching exercises, possible stretching help with a night splint, anti-inflammatory medications like ibuprofen, icing, and structural support with arch inserts to reduce heel rotation. Some of this can be initiated at home, but a medical evaluation is recommended to rule out less common but more concerning issues in the heel bone. Posted on 07/30/2017Think you might have a wart?